Venetian Chandeliers: the real venetian atmosphere! 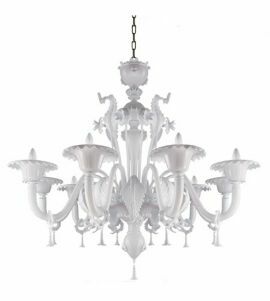 View our exclusive line of Venetian Chandeliers which reflect the motifs of the ancient tradition of glassmaking in the Venetian Lagoon. They have been created with a typical design and traditional lines such as leaves and flowers, decorations and embroidery on the cups with drops and pendants to complete a unique and special piece of art. Bring a touch of class to your home with the authentic and original Venetian style. And if you own an Italian Restaurant, why not create an elegant, warm and stylish atmosphere with one of our beautiful Venetian Chandeliers? The Murano Store stocks a wide range of traditional Venetian chandeliers to grace any living space. These elegant chandeliers are fabricated using traditional Murano glassmaking techniques to create a stunning lighting centrepiece that will enhance any room and decor. The San Stae chandelier features a classic design in rich red and transparent crystal, with a graceful, arching flower and leaf embellishment to the light. The San Stae chandelier is also available in classic black and transparent crystal, with 18 lights for maximum impact. The Veneziano six light chandelier in green has a unique leaf and flower design, with graceful flower cups cradling each separate light bulb. The green chandelier will be a unique addition to rooms and casts a warm glow of light which will highlights its subtle green colouring. 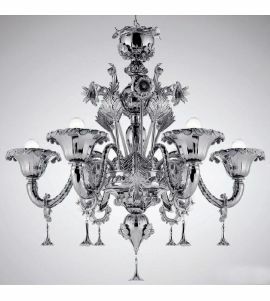 The Veneziano chandelier is also available with a milky white finish or featuring precious silver or gold plating. 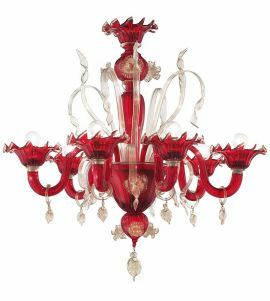 The San Marco chandelier has an extravagant design in red and translucent crystal with gold accents. The San Marco chandelier has elegant suspended crystals featuring a leaf design and fluted red candle holders to create a warm glow in rooms. Find the most elegant collection of Venetian chandeliers online at the Murano Store.